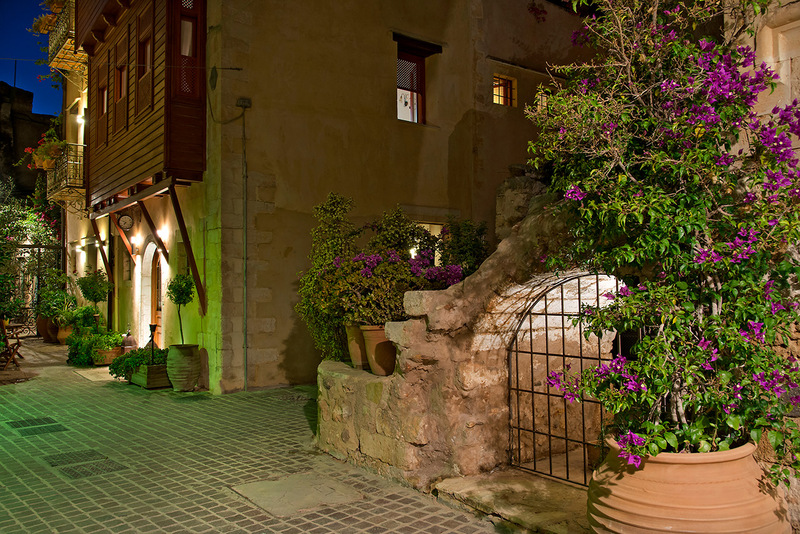 In the neighbourhood of “Platia Rouga”, in Splantzia – part of the historic district of Chania in Crete – stands the hotel known today as ‘Ionas Boutique Hotel’. Being itself a fine example of a reconstructed architectural treasure, it is located next to the historic church of Agia Irini and close to the monastery of Santa Maria della Misericordia. The Venetian stone features, such as the archway in the entrance of the hotel, have been repaired and restored, while at the base of the core building there still remain the original walls since 1538. The wooden facade of the original building was recreated based on the traces found and is an example of its Ottoman architecture features. Despite the fact that parts of the house were destroyed by the German bombardments during World War II, its occupants kept on living in the main part of the house, which has remained in the family’s hands until the present time. The historic building that now houses ‘Ionas Boutique Hotel’ came into the current owner’s family in 1929. This is when his great- grandparent returned to Crete from Asia Minor, during the exchange of populations between Greece and Turkey, after the Greco-Turkish War of 1919-1922. The family though has actually been residing in Crete since 1400, something confirmed by ancestors’ church paintings – like those created by G. Provatopoulos, who happens to be related to Domenikos Theotokopoulos’ (El Greco) mother – preserved until today in the district of eastern Selino and more specifically in the Agios Georgios church, in Koustogerako. Several years ago, inspired by the idea to preserve a small piece of personal family history, as well as part of the greater whole of the area’s past, the building’s owner decided to restore the home and open it to the public as a top class hotel. The philosophy behind the painstaking reconstruction was to preserve the original features using traditional building techniques, while keeping modern needs and comforts in mind. The project was fortunate enough to be based on original historical documents and family records that have been kept for almost a century.